No? Yes? If you can read the above, quick, tell me what it has to do with culture. If not…. Can you read the next one? Yes? Perhaps this second one was easier for you? Why? Why is it we can read the above? Our minds interpret a lot of things every day, constantly. They make sense of the world around us. They do this by recognizing patterns, putting information into templates that are familiar to us. Obviously when we enter a new culture, the rules are different. The patterns are different, the templates unfamiliar. Our inability to make sense of what’s happening around us can cause us to feel disconcerted, maybe to lose confidence. Our past knowledge, from another place, can cause confusion. It can lead us to think we understand what we really don’t, to fail to see what is really there, or to miss important information. There are so many interesting photos and images floating around social media networks. How many of them are you able to use to promote cross-cultural understanding, like the two above? Come on, share your favorites! y asi logramos leer con facilidad. thinking about it. Be proud! 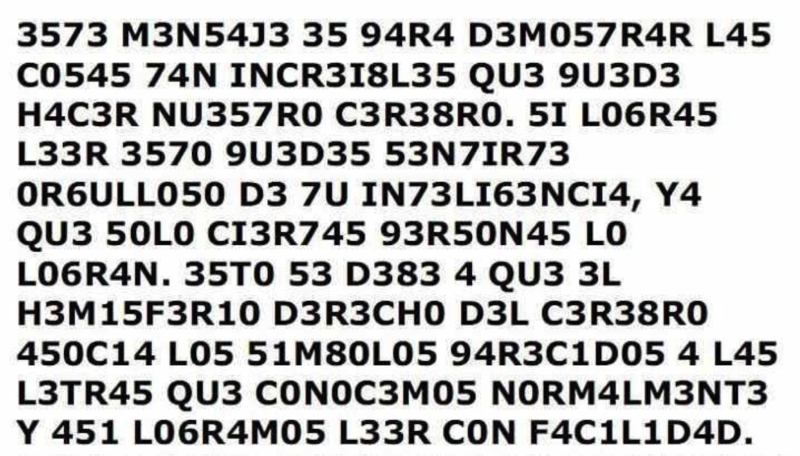 Only certain people can read this. This entry was posted in Exercise/activity and tagged Cross-cultural communication, cross-cultural skills, Cultural Detective, culture, diversity and inclusion, Education and Training, intercultural competence, Reading, stereotypes by Dianne Hofner Saphiere. Bookmark the permalink. Hi Dianne, just a great exercise that reminds me of our recent holiday in Craotia. We were totally disconnected with other known or less known languages and it became a game for us to learn some words or expressions to connect with the local population. Doing so, we ended up being able to read some Croatian (even though we did not understand what we read) simply because of listening and training to get the right pronunciation. Just an anecdote to end this post. In one of the restaurants we went, I recognized a word I heard in a Walloon dialect (french dialect in Belgian). The word is KRUMPIR in Croatian (pronounce it like the Spanish ‘U’ sound) which means potato. As for your exercise, making/creating links can bring us closer to what we perceive as “strange” at first sight. Thanks for sending the exercise, I will use it in a few days when running a new cross-cultural workshop. I remember traveling with my son in Bulgaria and it was the same: after about a week he could read phonetically the signs around us, though he of course had no idea what he was reading/what it meant. Olivier, please let me know how it goes when you use this exercise. I’ve only done it twice. Both times interesting, but nothing overwhelming. George Simons • Once I discovered it was Spanish, it wasn’t too hard, however of course not as easy as the English. This raises the importance of knowing the contexts of what we are perceiving in doing. Dianne Hofner Saphiere • Yes! Another great debriefing point to pull from something like this! Excellent! Oh and context does mean so so much! Olivier Marsily • I first started reading it in Spanish and forced myself through it without looking for the other language. By the way,the Spanish exercise is longer and more difficult. … any cultural link there? As you point out context plays an important role but there is something more important in my opinion: mindset. The ability we have to switch our mindset will largely impact our understanding of the new/changing context we are in. I have seen people struggling to accommodate with a new context simply because of their difficulty to let go what used to be their reference code and accept and enter the new one. Dianne, I read your post on “el por qué” and this is exactly what I mean. When we start asking this candid question of “WHY” we show openness to differences. Because of this mindset the new context we are in becomes clearer, generates sense and enables us to find value in it and eventually benefit from it. Dianne Hofner Saphiere • Mindset! Yes, indeed. I do love putting tools out there and learning what lessons others might pull from them. So insightful. Thank you, Olivier. YES, it can be so hard to let go of what we “know” in order to “see” something unseen. Glad you also enjoyed the “Por qué” post! Switching from LinkedIn to here, D. So, I didn’t even realize that there was an English version right underneath! I breezed through it, much more quickly than the Spanish – even though Spanish is my first language; it’s the language I spoke all the time until I was 18. BUT, I’ve been using English as my primary language for, um, 42-18 =24 years – including all my adult life (even though I still speak Spanish to my family on the phone). My head hurt after finishing ‘translating’ the Spanish, while the English required hardly any brainpower/energy at all. I find it both fascinating (and sad, given my Latin American cultural background) how much easier it was. It proves that context, in the form of time and space, also plays a huge part. Languages are so interesting that way, Rebecca. I am much funnier in Japanese, for example, than I am in English. Partly because in Japanese there are so many plays on words, which I like, though a lot of it is because Japanese is my third language and I am more conscious of it, so it’s somehow easier for me to play with the words to make new ones with double meanings. I’ve also noticed that when playing games or simulations, such as Redundancía, it can be easier to follow fake or imposed rules using a second or third language rather than my birth language. Hmmm….